This is the second public meeting for the Kennedy Station Mobility Hub Study. 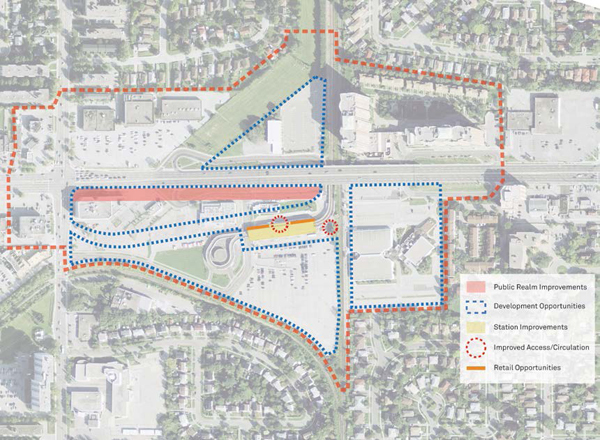 The Kennedy Station Mobility Hub Study is intended to serve as a background study for a future secondary plan for the area. 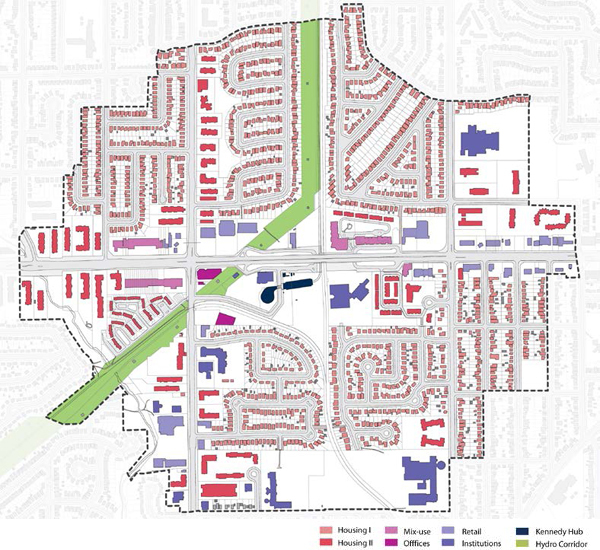 Conceptual plans created as part of this study will set the stage for detailed site plans and identify whether there are area-specific opportunities and constraints that warrant a municipal secondary plan or other legislated process for the broader mobility hub area. Your input today will help shape the study recommendations. 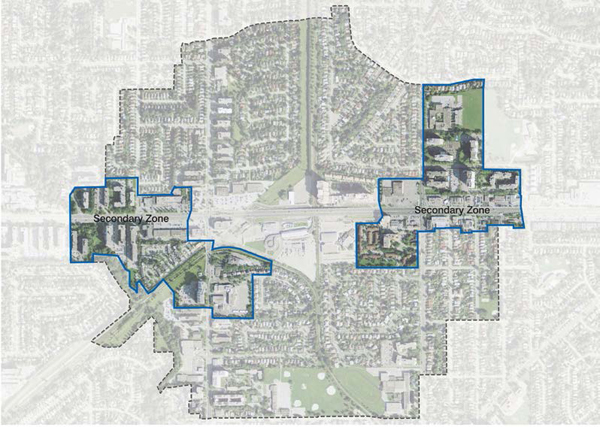 The Province’s Growth Plan for the Greater Golden Horseshoe (2006) defines major transit station areas as the area within an approximately 10-minute walk of any existing or planned higher order transit station within a settlement area or around a major bus depot in an urban core. 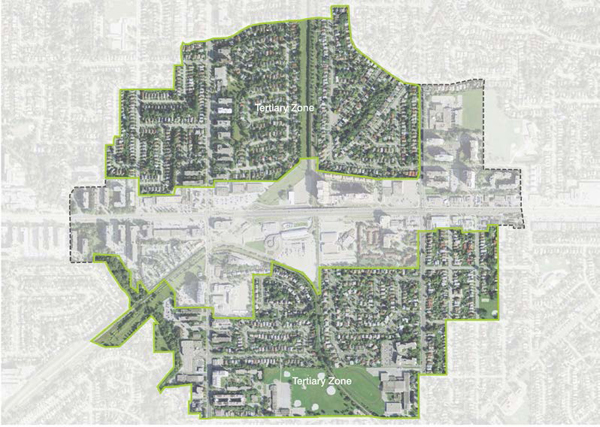 The Metrolinx Big Move Regional Transportation Plan (2008) identifies some major transit stations as mobility hubs. 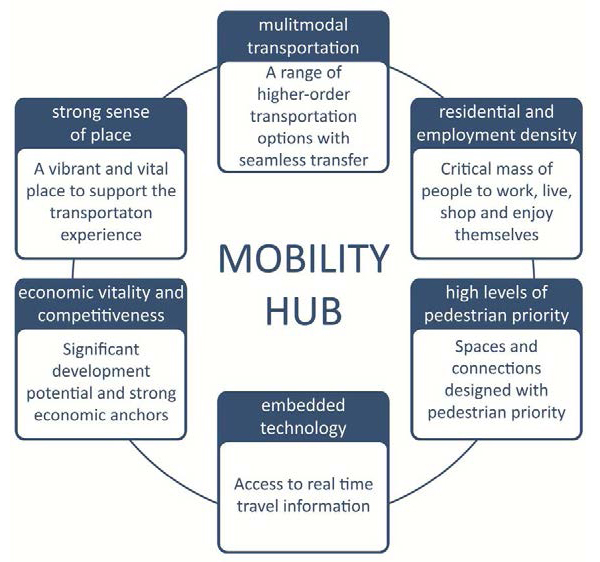 Mobility hubs are major transit stations and the surrounding areas with significant levels of planned transit service and high residential and employment development potential within an approximately 800m radius of the rapid transit station. 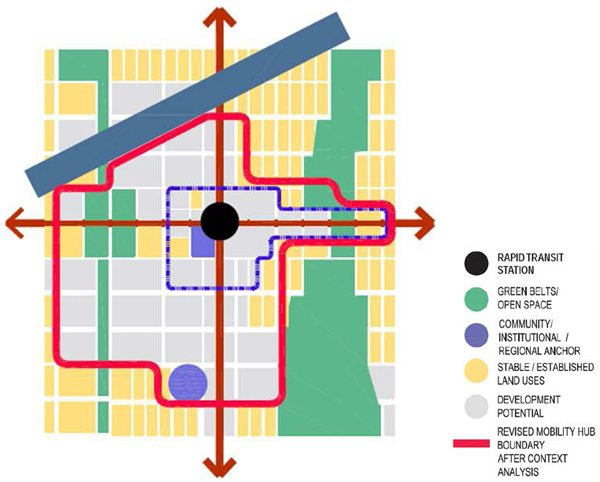 They are places of connectivity where different modes of transportation – from walking to rapid transit – come together seamlessly and where there is an intensive concentration of working, living, shopping and/or playing. The Big Move identifies 18 Anchor Hubs and 33 Gateway Hubs. 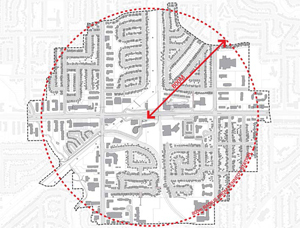 The Primary Zone includes the rapid transit station and associated facilities, within about a 250 metre radius. 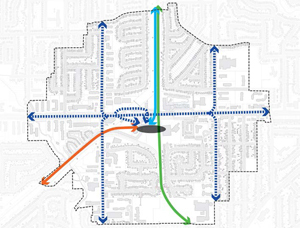 This zone is where most of the transferring between routes and modes takes place and should have the highest intensity and greatest mix of uses. 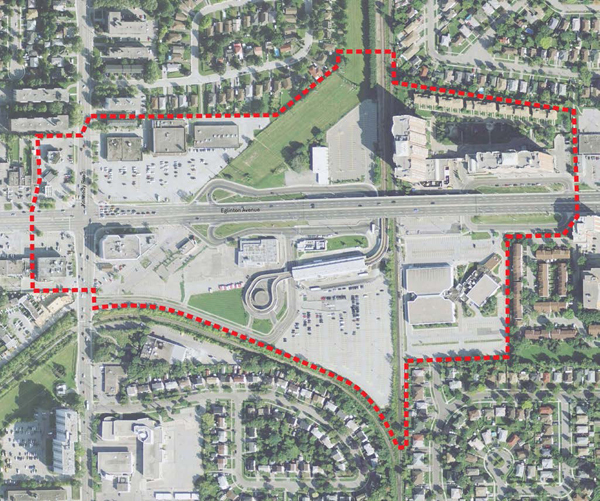 The Secondary Zone extends to about 500 metres from the station, and provides many opportunities for transit-oriented development. Direct and safe walking and cycling connections to the station are critical. The Tertiary Zone extends to approximately 800 metres from the station. 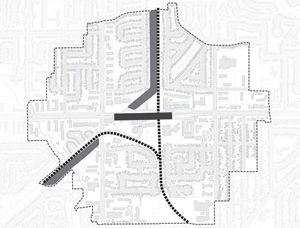 Cycling and feeder transit routes will play a larger role in this area as walking distances increase, and development height and density should be stepped down gradually to meet the surrounding context. 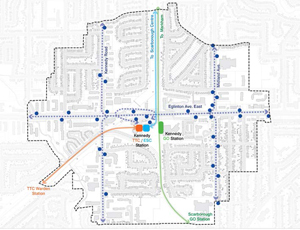 Beyond the 800m is the Catchment Area, which is the broader area of influence, from where most users of the regional rapid transit system will come. Here the emphasis is on direct and quick connections to the hub. 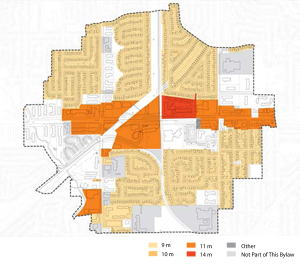 When defining the mobility hub planning area, the 800 m radius is a broad base case to begin from, but the local context should drive the delineation of the boundary. 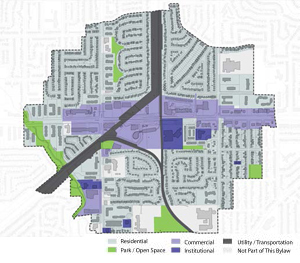 The image above indicates a sample planning area that illustrates how to account for development boundaries, environmental features, the legislative, policy and planning framework, community features and regional destinations and existing land use types. 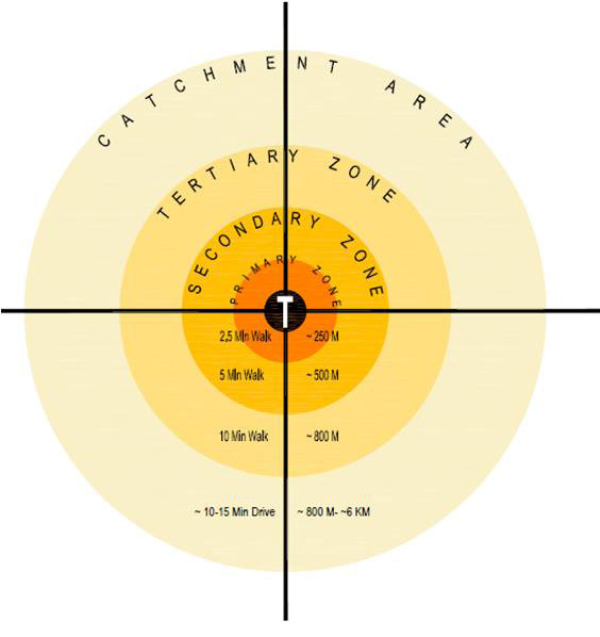 The Primary Zone - the area immediately adjacent to Kennedy Station. 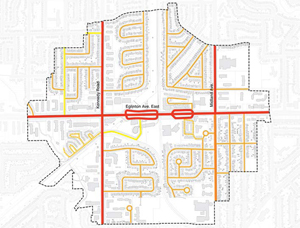 The Primary Zone has the greatest potential for intensification and improved connections between the various modes of transportation. 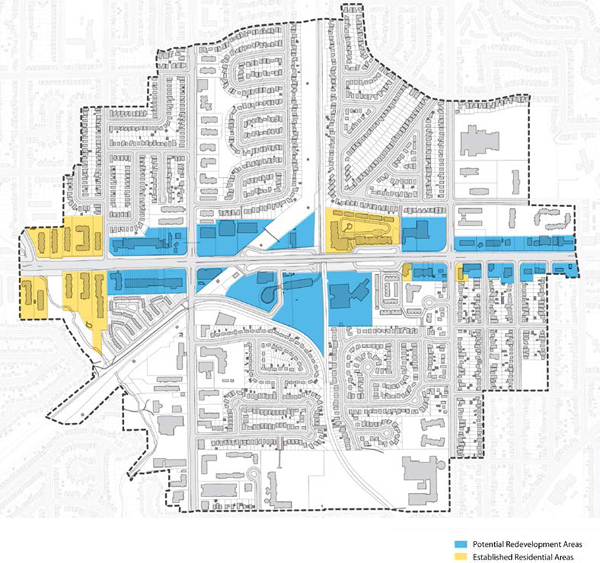 The Secondary Zone - the area outside of the Primary Zone with potential for new development, improved transit connectivity, façade improvements and streetscape enhancements. 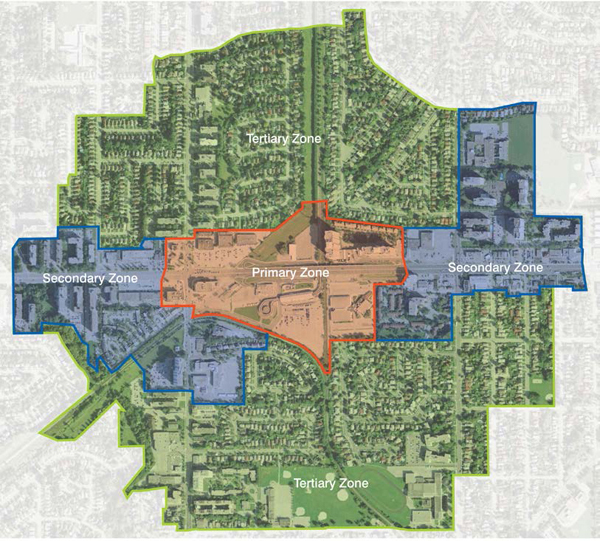 The Tertiary Zone - the transition zone from the Mobility Hub to the broader context area, these primarily stable residential neighborhoods will be subject to little change. A safe, convenient and attractive place. 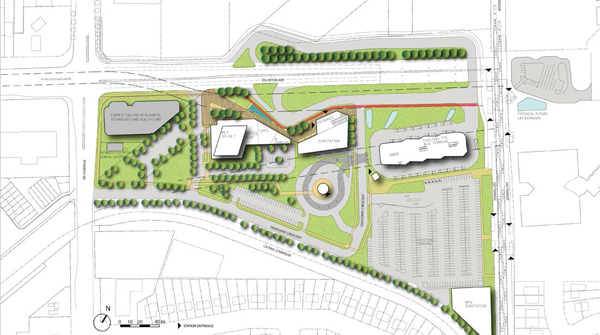 Completion of conceptual design drawings for the primary zone and accompanying development pro forma that indicates the net present value of the station plan to Metrolinx and potential partners. 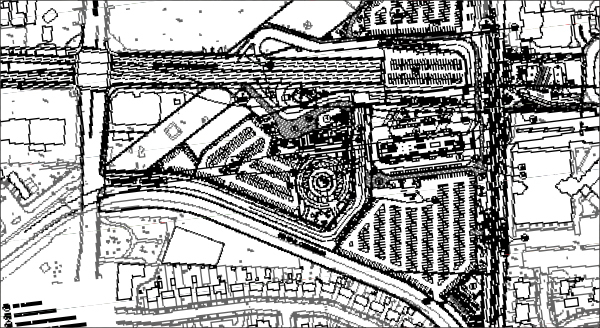 The plan shall optimize the place making role of the station while preserving and enhancing the site’s transportation functionality. Predominantly existing stable residential neighbourhoods with one or two storey houses. 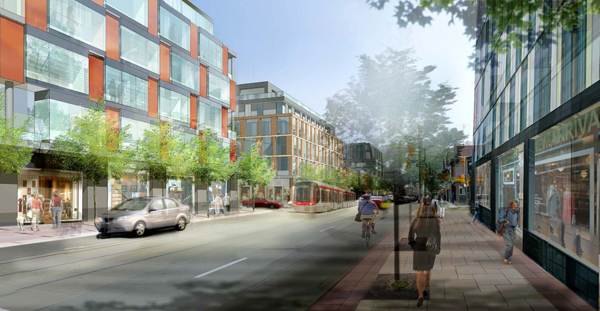 Eglinton Avenue East is a mix of high-density residential, high-density mixed-use, single-storey commercial, low-rise mixed-use and institutional uses. 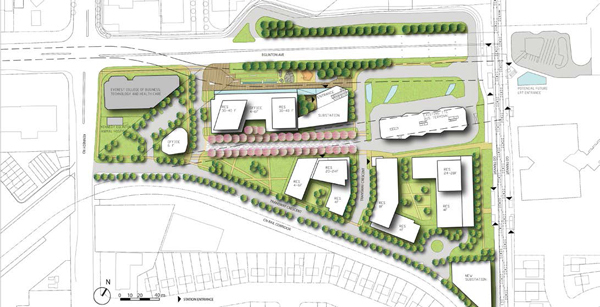 Kennedy Road is a mix of single-storey commercial, institutional and high-density residential. The hydro corridor is a continuous open space through the study area. 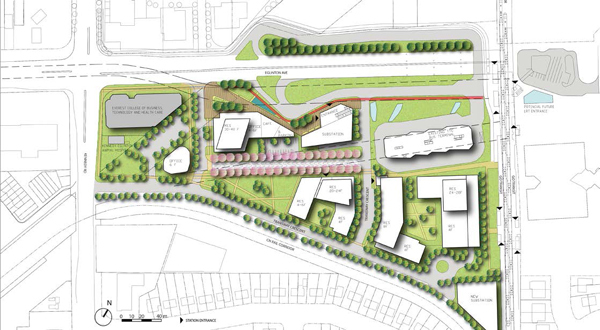 Within the study area there is a significant amount of redevelopment potential. 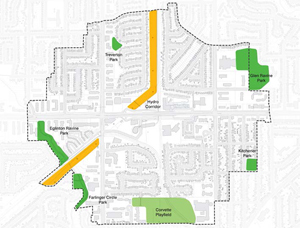 Outlined on the map below are the residential and mixed-use sites located along Eglinton Avenue West. 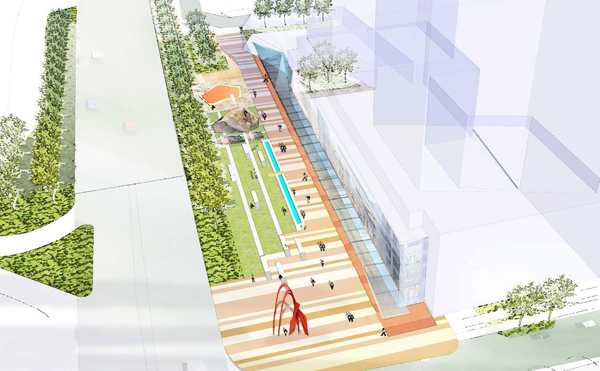 In the future, the character and built form of the mixed-use sites may change to create a more comfortable pedestrian environment. Eglinton Avenue East is Commercial Residential (CR) and Institutional (I). 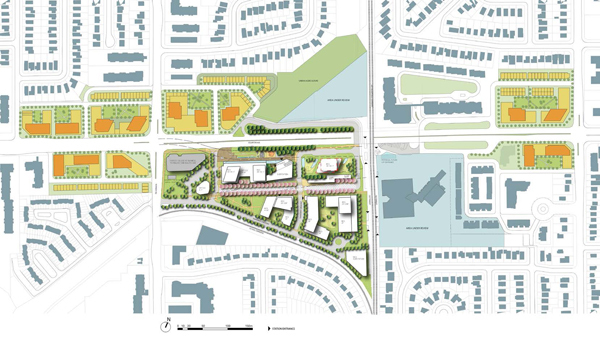 Eglinton Avenue East, west of Ionview Road, is Residential (RA). 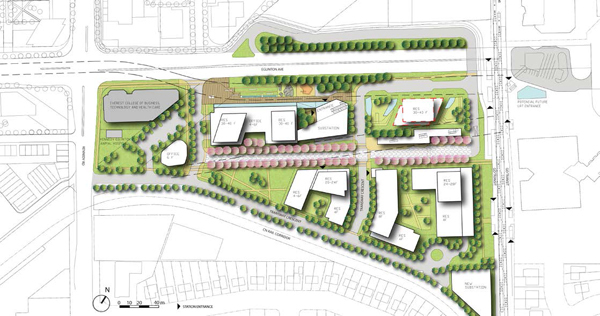 Kennedy Road is a mix of Commercial Residential, Residential and Institutional. The remainder of the study area is Residential. The study area has a 33% Lot Coverage limit. 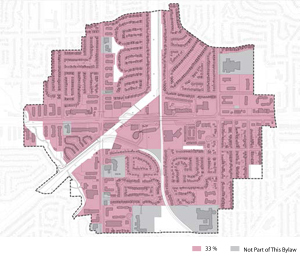 Lot coverage refers to the portion of the lot area covered by the ground floor area of all buildings and structures on a lot, expressed as a percentage of the lot area.